Voile is just lovely, lovely stuff. It is so soft and silky, drapes beautifully, makes gorgeous dresses and is still easy to sew with if you’re not brave enough to venture beyond cotton but want something a bit dressier! Today Laura Jane of Needles, Pins and Baking Tins is going to show you how to make a simple circle scarf with voile, which means you get to wear it round your neck and that feels like heaven. 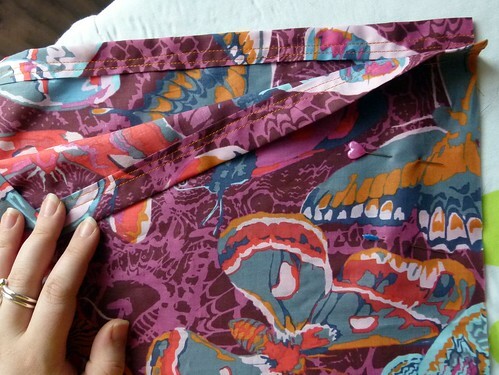 Read on for the tutorial, French seams and all! Thanks Laura! Whenever I wear my voile circle scarves I always get compliments. They are painfully simple to make (no really, they are… I think anyone could do it! ), so I thought I would share it with you guys. They only require 1.5m of voile, so you can quickly amass a whole collection. 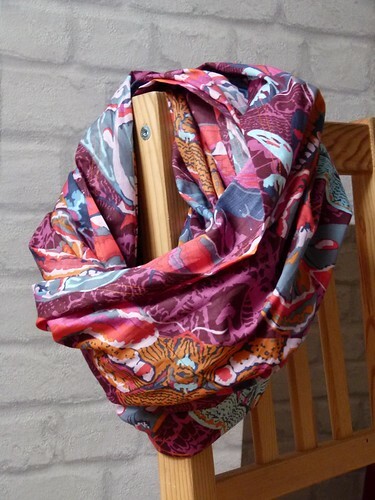 1.5m Cotton Voile – 1.5 meters will make a scarf that fits your neck snugly when doubled but can also be worn as a single loop. If you want extra “breathing room” and plan to only wear it as a double loop, start with 2 meters. Thread – I recommend Aurifil 40wt for this project. It gives great stitch definition and is just on the heavy end of perfect for the voile. 50wt would also be fine. 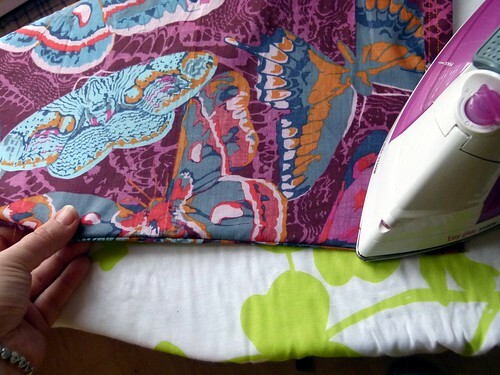 When working with voile, make friends with your pins and iron! 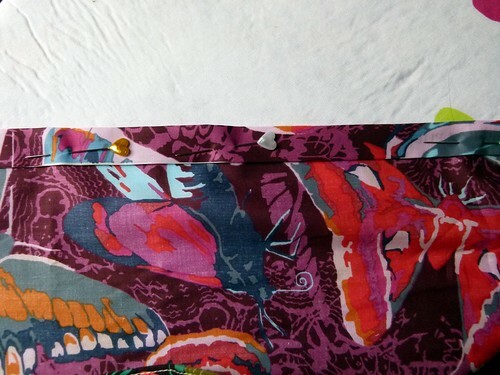 I’m not normally a pin girl, but voile is slippery like butter and can wiggle its way out of place very easily. It also creases much more easily that quilting cotton, so press press press whenever you get a chance! 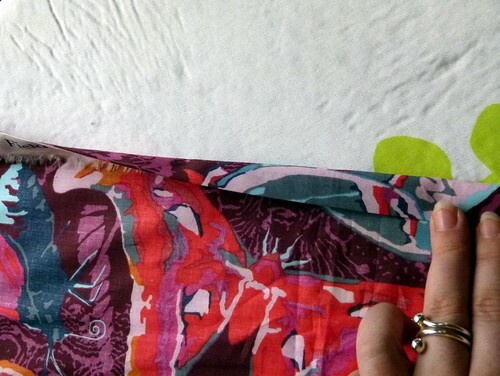 This scarf is all about the fabric, and so the finish has to be perfect. Step 1. Start by pressing the voile piece. Then fold and press the selvedge over on the wrong side. Step 2. Fold and press the salvedge over once more. Step 3. Pin the double fold in place. Step 4. 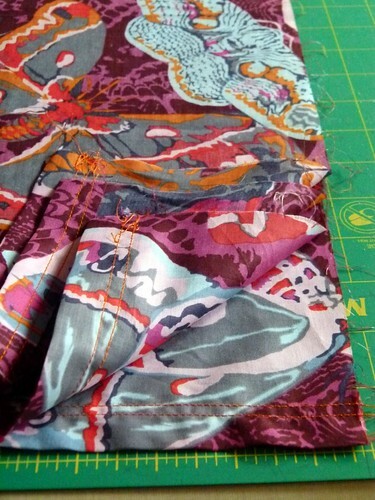 Sew with wrong side facing you, 1/4″ from the fold. Step 4. 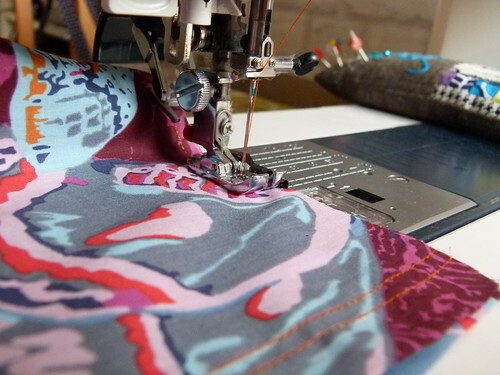 Repeat, sewing 1/4″ from the line you just sewed to make a double stitch line. Repeat for the second selvedge. Step 5. 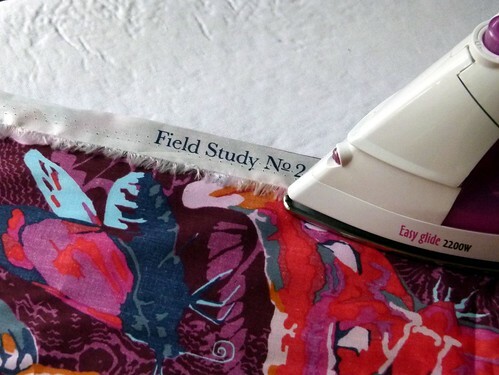 Press, then fold the voile piece in half lengthways so that the hems you just sewed are touching, then in half again so that raw edges are touching. Step 6. 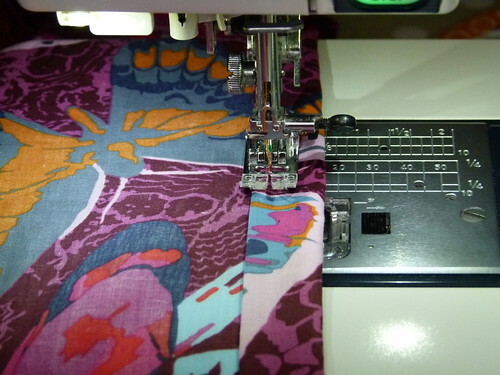 Arrange on cutting mat so that sewn hems are in a straight line. Square up and trim raw edges. Step 7. Fold voile piece, right side facing and raw edges touching. 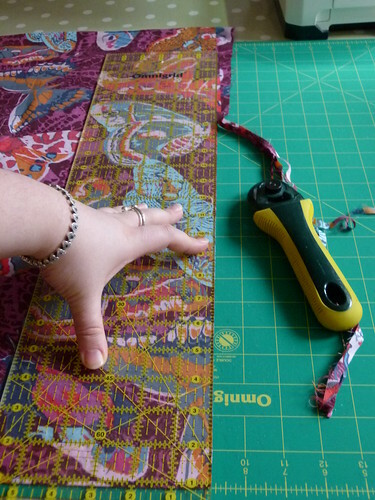 Pin down the length of the open edge. Step 8. 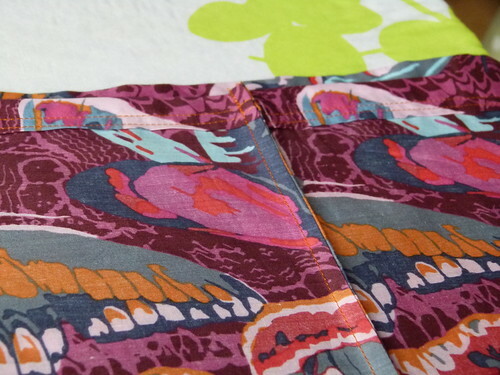 Sew a scant 3/8″ seam. Step 9. Turn wrong side out and carefully press back on itself. Step 10. 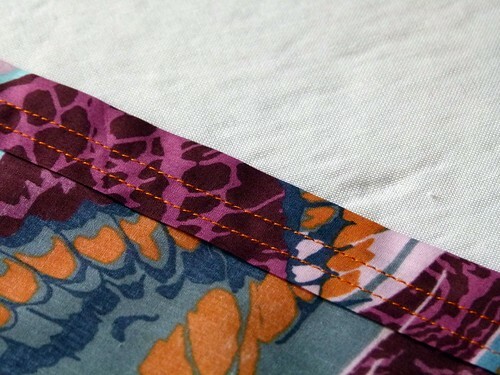 With wrong sides facing, sew a generous 1/4″ seam down this edge. This will encapsulate the raw edges of the voile. Press this seam to one side to lie flat. Step 11. Due to the nature of a french seam, you may find a few stray threads escape the stitching line and stick out on the right side. 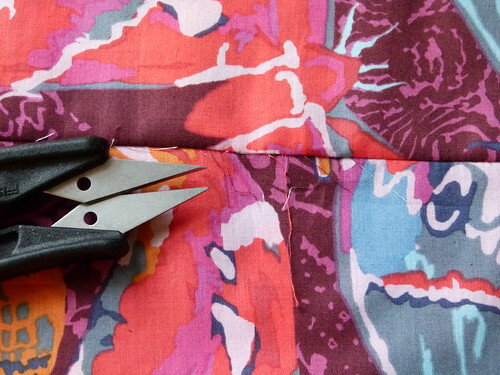 If so, trim these with thread snips. Step 12. Press the whole scarf, again,and admire!